BBC television news ran a piece bemoaning the bombardment of the rebel-held East Ghouta area of Damascus on Tuesday morning 20/02/2018. They interviewed Hamish de Bretton-Gordon, supposedly representing ‘Doctors Under Fire’. What he said could have been scripted by the UK’s Foreign Office. The Syrian army is trying to recapture the jihadist-controlled enclave. De Bretton-Gordon appeared to be arguing for injured and sick children to be allowed to leave. For De Bretton-Gordon, everything bad happening in East Ghouta seemed to be the fault of ‘Assad’ and ‘Putin’. The Al-Qaeda offshoot Jabhat al Nusra which holds the area held for him no responsibility at all. Even the UN Security Council has declared Al Nusra a terrorist organization. These Islamists control the Idlib enclave as well. They have torched churches and beheaded opponents. Further evidence here. And De Bretton-Gordon had not one single critical word to say about them. Civilians were under fire, he went on. He failed to mention that Al-Nusra might be holding them as human shields, as they did in Eastern Aleppo. The Syrian army liberated that area in December twenty-sixteen. 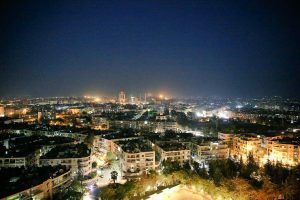 We ran a report on Aleppo’s liberation at the time. 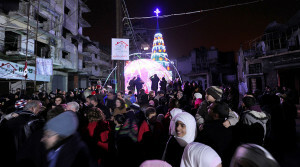 For the first time in five years the city’s Christians were able to celebrate Christmas free from constant bombardment from the Al-Nusra terrorists in the east . Celebrating Christmas in Aleppo December 2016. The US and UK Governments and the mainstream media hated the liberation of Eastern Aleppo. They will equally bewail the liberation of Eastern Ghouta, when it comes. 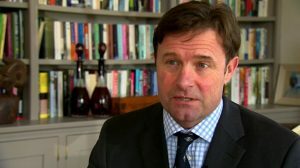 Indeed, during the BBC interview, Hamish de Bretton-Gordon came across as nothing more than a UK government sock-puppet. He confirmed this when he commended what he said were ‘the peace talks in Geneva’. We shall come to that below. 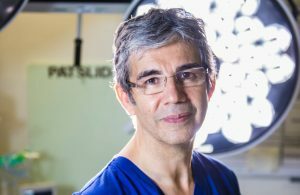 Mr David Nott is a respected surgeon but blames ‘Assad’ for everything. But what of this man, and what of ‘Doctors Under Fire’? Well, the latter has apparently just two members, De Bretton Gordon and one David Nott, a surgeon who has been in war-torn areas. Mr Nott similarly finds no good word to say about the Syrian government. Oddly, in a video on Vimeo from 2016 he says Doctors Under Fire will be a charity. The Charity Commission has no record of it, nor of ‘Medics under Fire’ which is what the Doctors Under Fire website is called. When you go to the website, at this time of writing, you’re invited to a rally on 7th May. On further investigation, that is 7th May 2016. Their website is two years out of date. Of course hospitals should not be attacked in war zones, but the Doctors Under Fire platform gives Messrs De B-G and Nott credibility to advance another agenda. Furthermore, this astonishing video collated all the times the ‘last hospital’ in eastern Aleppo was put out of action by ‘Syrian regime airstrikes’. Can you guess how many it was? And how do the mainstream media source their footage of sick children, hospitals, and dare we add, ‘doctors under fire’? They are entirely dependent on the terrorists. No western journalist can venture into their areas. Why? For fear of being kidnapped and held for ransom by the very people they champion. De Bretton Gordon also claimed on the BBC a hospital in eastern Ghouta had been hit. That was why they gave him a platform under his ‘Doctors Under Fire’ persona. But again, it was second-hand terrorist propaganda. Here, the impressive ‘Off-Guardian’ website exposes the Syrian totem head of the ‘White Helmets’, which was a British Foreign Office creation, as we investigated here. This relentless tugging at western heart-strings is a scam and the msm know it. Hamish de Bretton-Gordon is a retired Colonel with an OBE. He commanded NATO’s Rapid Reaction Chemical Biological Radiological and Nuclear (CBRN) Battalion. He ran a company called SecureBio with, we read on this ‘military speakers’ website, ‘an impressive list of blue chip clients globally.’ However, Companies House says SecureBio resolved to go into liquidation in June 2015. The Colonel now apparently works for a company which makes breathing masks, Avon Protection. His LinkedIn profile claims he is ‘Managing Director CBRN’ of Avon, despite not actually being a director. He also claims still to be director of SecureBio. He does not mention that company was dissolved in August 2017 with debts over £715,000. 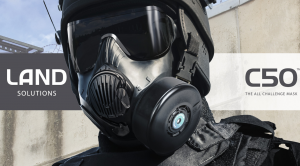 De Bretton-Gordon has teamed up with Avon Protection which makes breathing masks. De Bretton-Gordon teamed up with Avon in 2014. 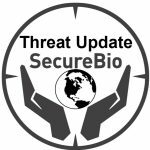 Avon then took over the SecureBio name in June 2015 as SecureBio Ltd shut down. Avon did not take over SecureBio Ltd’s large debts. De Bretton-Gordon no longer has any connection with military field-work. Nevertheless, he has continued access to the world’s media when subjects like Syria and alleged chemical weapons come up. Securebio’s YouTube channel is still online and has a number of videos of the colonel calling for ‘safe havens’ for terrorists. He has appeared frequently on Sunni-Muslim Qatar’s Al Jazeera TV channel. And as this Guardian opinion piece shows, he is not slow to blame ‘Assad’ and ‘Putin’ for each and every alleged chemical attack, just as the UK Foreign Office would want him to do. In this belligerent BBC article he even calls on France to declare war by dropping bombs on Syria. Finally, why did the Colonel’s promotion of the Geneva peace talks raise the alarm? Because this is a UK-driven political view. In reality the Geneva talks stalled in February twenty-seventeen. The Kurds took against the inconsequential opposition in exile pompously called the High Negotiations Committee. The Geneva talks finally collapsed in November when the Syrians would not agree to President Assad stepping aside, a key, but stupid, UK and US demand. 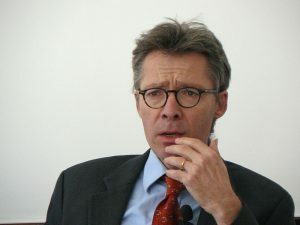 The Guardian’s highly-respected Patrick Wintour says the talks De Bretton Gordon extols are ‘perilously shorn of credibility’. Meanwhile, the real peace talks, unmentioned by the Colonel, have been held in Astana, capital of Kazakhstan. They are brokered by Russia, so the UK wants them to fail. But the UN’s Staffan de Mistura says the Astana talks are making small but ‘clear progress’ to reducing violence in Syria. They have now moved to Sochi on the Black Sea and we need to pray for them. Make no mistake, the UK government helped start the dreadful civil war in Syria. Even now its tame media pundits cannot bear the idea that the Islamic terrorists we assisted are mercifully losing. Colonel Hamish de Bretton-Gordon will keep ringing the UK Government bell. A knighthood cannot be far away. But we must take what he and the rest of the BBC’s pro-Foreign Office pundits say with a very large pinch of salt. The BBC ‘s original commission was ‘giving the truth to the nations’. It has changed somewhat…. But you could hardly blame the BBC if some countries are often at war ( let’s never forget that Europe isn’t ! ). Might it be the same with truth ? “What is truth?” is sometimes discussed by philosophers. However, have you any reference to this “original commission” please ? Nobody is perfect, but it is worth pointing out that during the Second World War and since, the BBC has earned in many quarters the reputation of being closer to the truth than the propaganda services of other countries. There are reasons why, for British interests and perhaps for everyone’s interests, the BBC does have to spin things a little sometimes. This is merely written in reply to Doulos, not as a comment on the revelations of the original article.